The Lao Ministry of Industry and Commerce has reported that the value of imports and exports climbed to more than $4.52 billion in the first six months of 2013, 5.36 per cent more than in the same period of 2012 when the figure was about $4.29 billion. The ministry’s Import and Export Department said that the $4.52 billion figure included exports worth over $1.53 billion, a 4.14 per cent increase over the same period in 2012. 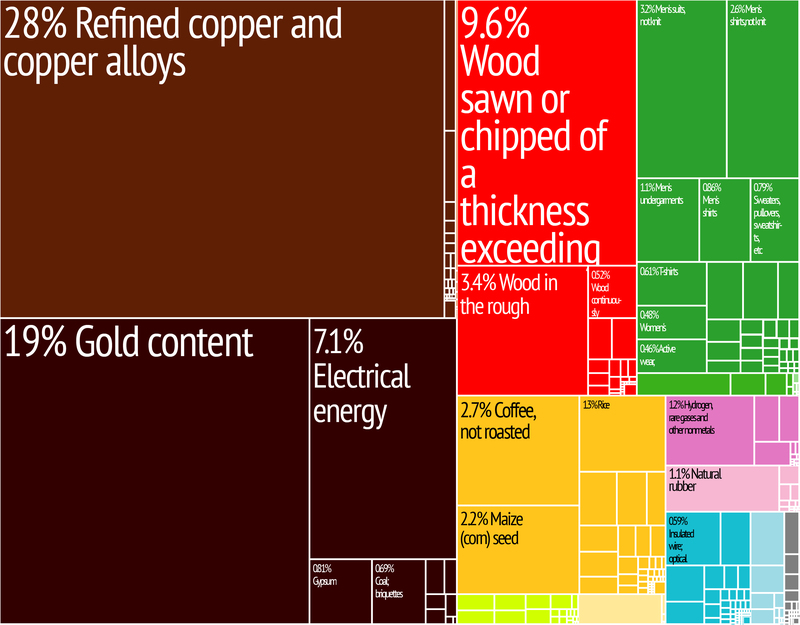 Exports rose due to larger exports of minerals, electricity and wooden products. Thailand was Laos’ main export market followed by China, Vietnam, Japan and India. Exports to Thailand were worth about $619.29 million and accounted for 40.95 per cent of total exports, while goods worth about $416.28 million were exported to China, accounting for 27.53 per cent of the total. Exports to Vietnam were worth over $261.18 million and accounted for 17.27 per cent, while goods worth $60.6 million were exported to Japan, comprising 4.01 per cent. Exports to India were valued at $40.3 million and accounted for 2.66 per cent of total exports. Mineral exports comprised 47.86 per cent of the total and rose 8.15 per cent over last year, while electricity exports rose by 3.36 per cent and accounted for 16.41 per cent of the total. Other industrial products, including garments, accounted for 7.17 per cent, with wooden products taking a 23.26 per cent share, while agricultural exports represented only 5.3 per cent. In the imports category, the total value exceeded $2.98 billion in the first six months, about six per cent higher than the same period in 2012. The value of imports surged due to economic growth, which drove up the need for imports across all sectors. Goods imported consisted mainly of fuel, vehicles, construction equipment, raw materials for industrial production, food, and other supplies. Imports of fuel and gas accounted for 19.74 per cent of the total, and increased by 1.66 per cent on last year, while imports of vehicles and spare parts accounted for 18.7 per cent and increased by 15.35 per cent. Imports mainly came from neighbouring countries, including Thailand, China and Vietnam, in addition to South Korea and Japan.